Dionne Williamson has seen, time and time again, the power and joy that a safe, comfortable home can give to those who need it the most. A woman, who finally feels at home, is moved to tears by seeing her kitchen cabinets stocked with dishes and glassware. A child beams from ear to ear because she finally has her own bedroom after living in a homeless shelter. Less stressed, a mother can focus on her children because her house is well-furnished and secure. 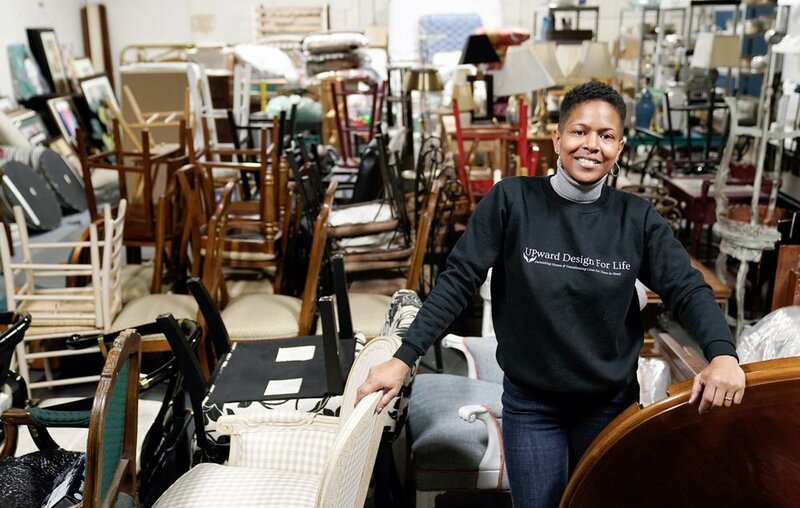 Williamson is the founder of Upward Design for Life, a nonprofit that provides new and gently used furnishings to individuals and families who are transitioning into their own residence and need assistance with basic essentials. All of her clients are referred by partner agencies, including the Family Justice Center, Child & Family Services, Erie County Social Services and Buffalo City Mission. Often, they have been recently homeless or are domestic violence survivors. Upward Design for Life launched in January 2018 and, as of October, had completed 13 projects, relying solely on volunteers, monetary contributions and donations of furniture, decor or other services. In-kind partners, like the Buffalo Museum of Science and Hyatt Regency, have also stepped up by donating complimentary admission and hotel stays for the family to enjoy during their installation. This fall, the organization moved into a 2,000-square-foot warehouse space that will allow it to support more clients—a huge boost from its previous 12-by-10-foot storage unit.